Beach residents have become experts in finding a silver lining even in a storm as damaging as this. Thursday’s historic storm impacted coastal communities across New England and at Hampton Beach in New Hampshire, longtime residents say they’ve never seen anything like it. "Nope," said Frank Kellicker. "Maybe the Blizzard of '78." And those outside Friday morning say cleanup is harder than it’s ever been. "It’s wet and heavy and doesn’t push very well," said plow driver Adam McLean. Maine recorded the third highest tide during a strong winter storm, creating coastal flooding that covered the downtown area known as Dock Square. "It’s impossible to move it," said Tony Denaro. Residents learned quickly that snow blowers are made for snow and not slush. "I tried it, it won’t work," Denaro said. It’s the aftermath of a historic storm surge that flooded Brown Avenue, where Jim Gallagher lives. He captured video of the flooding on his cell phone. "That’s the shock of it all, you see how fast it’s coming in but you don’t know when it’s going to actually stop," Gallagher said. 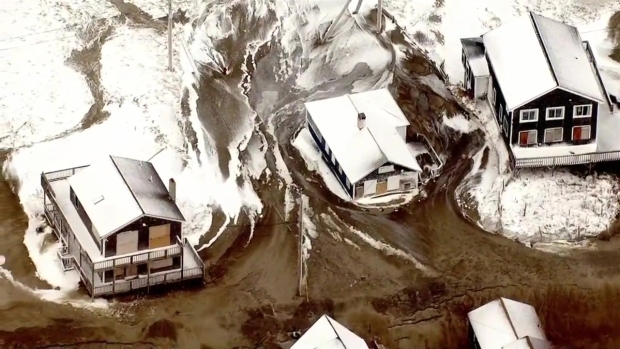 Sky Ranger video shows homes in Scituate, Massachusetts, surrounded by frozen slush and sand after storm surge-fueled high tides during Thursday's snowstorm that pummeled the region. For hours, roads were shut down and firefighters rescued people from their cars and their homes. "Nobody expected it to come up that quick, that fast like that, it was pretty bad," he said. Bad then and maybe worse now as neighbors deal with the consequences of living along the coast. 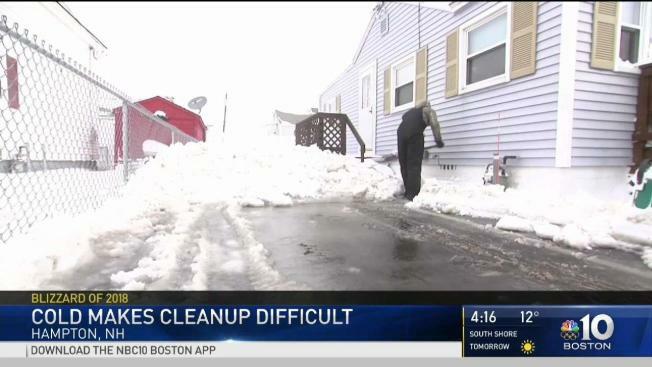 "The floor in the back is all wet," Kellicker said as he shoveled out his car so it could be towed. "They’re not turning over at all," said tow truck driver John Murphy who was busy towing all day Friday. Still, beach residents have become experts in finding a silver lining even in a storm as damaging as this. Kellicker says there is nowhere he’d rather be than here. "Never," he said smiling. "Come back in the summertime." Gallagher agreed, saying, "No, I love Hampton Beach." When asked is summers make up for this, Gallagher replied, "tenfold." During the storm, firefighters rescued more than ten people from stranded vehicles and helped evacuate 11 people from their homes. Authorities say despite the dangerous conditions, no one was hurt.